The Model 6241 utilizes aggressive, yet innovative design approaches to deliver sensible, high performance features that meet these demands. - Standard sized commercial 2-1/2” interlocking flat slats in 24-gauge steel are hot-dipped galvanized, pre-painted in gray and white, and maintain high security with lighter weight and reduced cost. - Cast iron, malleable endlocks exceed industry expectations for performance and wear in a light industrial door. - Structural steel three-angle guides utilize integral bell mouths, curtain stops and Quick-Release guide angles for higher security, maximum durability, faster installation times and no-hassle, simplified repair requirements. - Repairs are quickly and inexpensively expedited with common, readily available components. 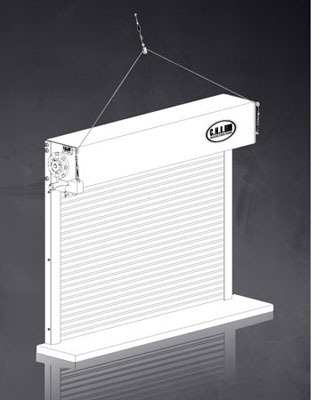 - Full-sized headplates provides a solid platform for chain hoist or motor operation. - Half-hexagonal formed hoods, pre-finished in white, deliver superior structural rigidity and high aesthetic appeal. - Heavy-duty, 3.5:1 chain hoists install quickly and provide a fine balance between operator effort and cycling speed. - Security is enhanced with plated slide locks for manual operation, or a chain keeper suitable for padlocking for chain hoist operation. - Value is enhanced by building real time performance expectations into time proven, reduced cost designs. At C.H.I. we understand that the architect, building owner, installer and service technician each seeks value with absolute reliability. The Series 6000 simplifies the process of selection by integrating the highest design principles into standard features. Simply stated, Series 6000 Service Doors are manufactured to meet your highest expectations of quality, fit and function with no excuses. 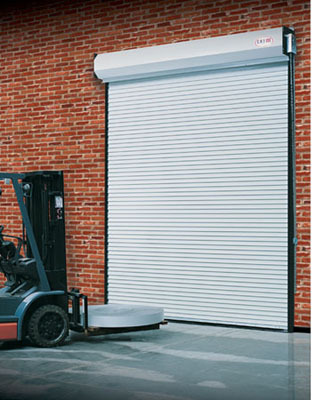 Series 6000 Service Doors are available with curved or flat slat service curtains as well as fully weathersealed and insulated curtains. A standard white back and hood provides a bright, light reflecting interior surface. Guides feature a medium black primer coat that matches well with standard paint colors as well as many powder coat choices. Curtains are offered in solid gray, gray and white or tan and white paint finishes. 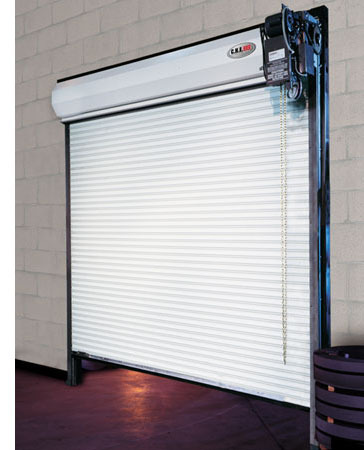 - The Model 6544 features a clear anodized, extruded aluminum curtain and guides. 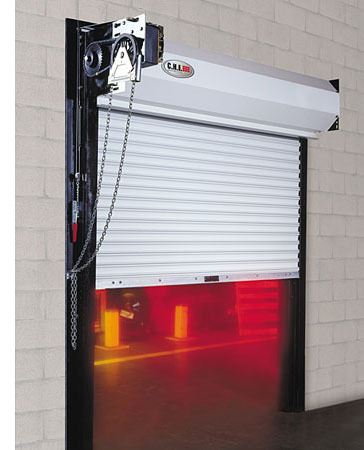 - The Model 6522 features a painted steel curtain with clear anodized, extruded aluminum guides. - The Model 6566 features a stainless steel curtain with a #4 finish and stainless steel “J” guides. - Blemish-free exterior: The Models 6544 and 6522 feature hidden headplates, guides and wall fasteners for a well-blended, architecturally sensitive appearance. - Visible seams and shadow lines are eliminated from extruded aluminum guides due to unique joint designs. - Soft brush guide runners silence curtain operation and seal out dust and noise. - Dual-bottom bar seal assures a soft, non-marring touch down to valuable counter tops. - Thumb turn locks are spring assisted, and secure each side of the bottom bar into hidden recesses in the guides. – Cylinder locking is optional for each side. - Integral lift rails on the bottom bar provide full width manual access and simplified lifting. - Invisible tubular motor operation, awning crank operation, or exterior mount motor is optional. - Compact in design, the Series 6500 installs into minimum head and side room dimensions. Drop speed is governed by a quiet, centrifugal brake to between 6″ to 12″ per second. U.L. labeled for installation to approved sheetrock, masonry and steel openings, Series 7500 Fire Shutters meet all U.L. requirements for counter and window openings. - 45 minute, 90 minute and 3 hour U.L. labels with full compliance to NFPA-80 standards. 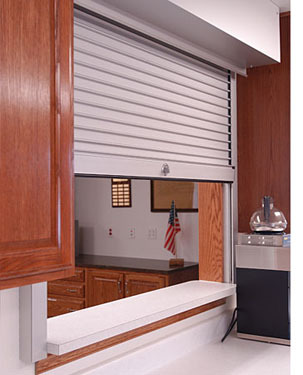 - Standard curtain features 1 1/2” pre-painted, hot-dipped galvanized steel slats. - Optional stainless steel curtain and guides available in a #4 finish. - Shop painted guides in a medium gloss black matches well with many powder coat options. - Reliable viscous governor provides smooth, quiet drop testing. - Easily drop tested and reset with a minimum of downtime to assure operational readiness. - Designed for face of wall mount and between-jamb mounting configurations. - Manual push up operation is standard. Gear reduced awning crank operation is optional. - Bottom bar slide bolt locks are standard with cylinder locking optional. - 165-degree fusible links are provided as standard detection/release devices. - May be installed with all approved detection and release devices. - Attractive, compact hood is designed for maximum efficiency in tight areas.